Is Italy Really Ready for Starbucks Milan? This inscription (translated from Italian) shines bright â" literally, itâs backlit â" on a wall of Starbucksâ newest location in Milan, Italy, a massive coffee roaster, cafe, and shop, open to the public as of September 7. Those familiar with the coffee brand or its dreamer of a founder, Howard Schultz, will know that statement might be a platitude, but itâs not hyperbole. Milan has long been peddled as the spiritual birthplace of Starbucks. âDuring my fir st trip to Milan in 1983, I was captivated by the sense of community I found in the cityâs espresso bars â" the moments of human connection that passed so freely and genuinely between baristas and their customers,â Schultz, Starbucksâ former CEO, founder, and chairman emeritus, wrote in a release. After becoming infatuated with âthe theater, romance, art, and magic of experiencing espressoâ in Italy, Schultz acquired Starbucks in 1988, intent on introducing the Italian coffee experience â" complete with espresso, cappuccino, and professional baristas â" to Americans. Over the next 30 years, he exported his idea of the Italian coffee-drinking experience into more than 28,000 locations in 78 countries. Itâs thus both ironic and completely understandable that the country most associated with coffee eluded Schultzâs Starbucks for 28 years. In 2016, with some trepidation, the company announced its entree into Italy. Milan was chosen over Rome, Italyâs capital, d ue to Schultzâs personal ties to it. By all accounts, Starbucksâ new Roastery is an overeager and visually striking tribute to Starbucksâ white whale. A heightened fantasy of Italian aesthetics, itâs not as campy as Disney World, but still vividly American with its excessive polish and vaguely steampunk style. The 25,000-square-foot space (once a post office, and before that a stock exchange) houses many bells and whistles: The physical roaster was made by Scolari, an Italian manufacturer of industrial coffee equipment; casks are made from bronze, a material often used in Milanese decor and architecture; counters are honed out of the same 30-ton block of Calacatta Macchia Verde marble from Tuscany. A mermaid statue â" Starbucksâ figurehead â" adorns the Roasteryâs portico, and was carved out of Carrara marble by Italian sculptor Giovanni Baldieri. Though Starbucksâ press releases promised âhumilityâ and ârespect,â the overall effect is one of excessiv e flamboyance, not unlike an American dressing themselves in head-to-toe Gucci, Fendi, and Versace while on holiday in Rome. Outside Starbucks Roastery in Milan, Italy. But does Starbucks fit into the cityâs current coffee culture? 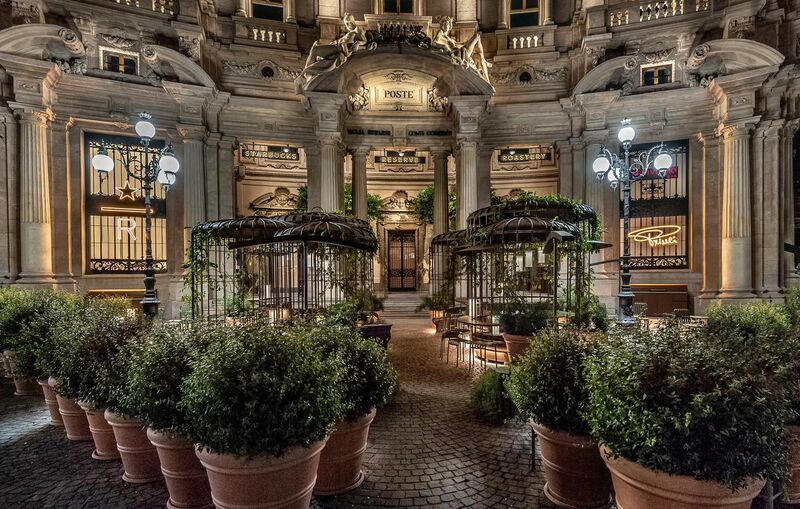 In Milan, both everyday coffee bars and gilded, opulent establishments (such as Cova in via Monte Napoleone, established in 1817) are an integral part of the city. There are 149,429 coffee bars in Italy, and 63.8 percent of Italians have their breakfast at coffee bars or coffee-pastry-shop hybrids, each spending an average of 2 to 3 Euros for coffee and a breakfast pastry, according to a 2017 report by FIPE (the Italian Federation of Public Exercises). The coffee bar is perhaps the most distinctive lifestyle landmark of Italy. A grounding daily ritual for Italians of all walks of life, coffee bars are open all day. They offer coffee and pastries for breakfast; no-frills lunch options (salads, sandwiches, and piadine); and aperitivi in the early evening. The proprietors of neighborhood establishments greet regulars by their first names. Standard Italian coffee counter menus are extremely concise. âCaffÃ¨â means âespressoâ by default. Variations on the theme are caffÃ© lungo, caffÃ¨ macchiato, caffÃ¨ ristretto, latte macchiato, and cappuccino. By contrast, the menu at Starbucksâ Milan Roastery offers more than 115 coffee and tea-based drinks. Thereâs a tea âperfumed with Jasmine aromas with ginger spice and orange peel accents.â An artisanal affogato station is dubbed âFire and Ice.â A new drink, the Cordusio, which pays tribute to the marocchino (a shot of espresso, cocoa powder, a nd milk froth), was launched worldwide this week in honor of the opening. The reactions from Milanese are mixed. Lorenzo Bises, a local writer with a background in art history, promotes Milanese culture but says heâll try Starbucksâ new megashop â" eventually. âIf itâs not too crowded and teeming with teenagers, which usually happens to trendynew establishments, I wonât mind going,â he says. âI am a loyal Starbucks customer when I travel abroad,â says Federico Caligaris, a financial advisor based in Milan who admits to loving mocha-based concoctions . âI think it guarantees service and products of a certain level, in contexts where itâs usually hard to come by a high-quality beverage.â Still, he says he probably wonât be a regular at the Milano Roastery because itâs not within walking distance from his office. Whether or not Starbucksâ coffee will be judged as bitter or not is still up in the air. But in an effort to show i ts support of local Italian businesses, the coffee giant partnered with a longstanding and well-liked bakery chain, Princi. Not just a series of coffee counters, thereâs a bakery inside the new Roastery, and, as part of the partnership, Starbucks is bringing Princi stateside. 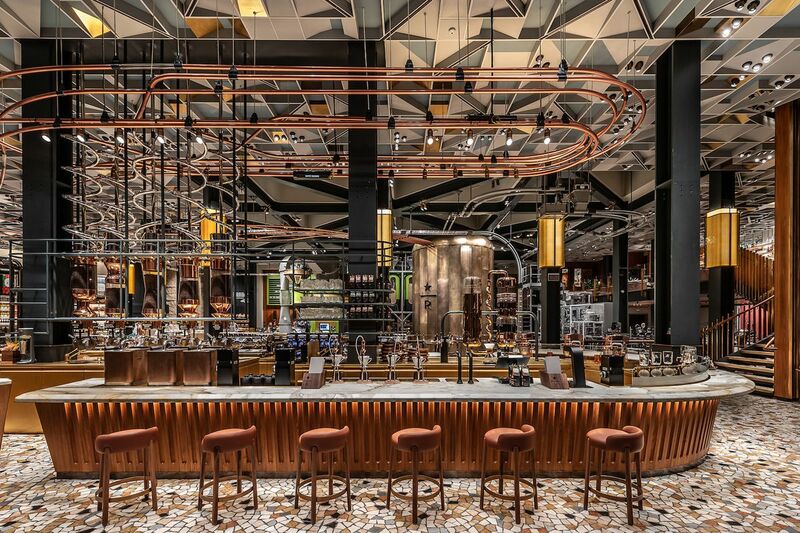 Whatâs more, Starbucksâ Milan Roastery opens at a time when the city is rife with establishments that nod to American cuisine and beverages. Twenty years ago, former Danone manager Marco DâArrigo launched California Bakery, which specializes in all-American desserts such as cookies, apple pie, and cherry pie. An unassuming storefront in the late 1990s, it now has eight locations all over Milan. âAmerica Coffeeâ is the first caffeinated beverage listed. Tizzyâs NY Bar and Grill, located on the Naviglio is a New York-style diner, complete with subway tiles, that offers a slightly refined version of diner fare. The city also sports Coreyâs Soul Chicken, a soul-food restaurant operated by Ke ntucky-native Corey McCathern. And, thereâs a thriving number of Starbucks-inspired cafe chains, which, like Starbucks in the U.S. cater to students and freelancers who need a place to study and work. Arnold Coffee, with locations in Milan, Florence, and Rome claims to be Italyâs first American-style coffee bar, with its own version of a Caramel Macchiato; Turin and Rome have Busters Coffee, which serves frappÃ©s, shakes, and iced coffees. The City of Naples boasts Cup Capâs CafÃ©, whose tagline is âAmerican Style, Neapolitan Coffee.â On this note, purists just have to acknowledge the obvious: There is, indeed, a high demand for beverages beyond the espresso/macchiato/cappuccino trifecta. âStarbucks is trendy.Itâs coolto visit Starbucks, parade around a city with your paper cup, and take a photo of yourself with it for the Instagram,â Caligaris says. On this note, doesnât it almost seem counterintuitive of Starbucks, given the demand for sugary and insta-friendly concoctions from younger crowds, to open a roastery that overemphasizes the âItalianâ component? The cups are even lacking Starbucksâ famed logo, in favor of a single star. âThe choice to enter the Italian marketplace was a careful one, and we have taken our time to ensure that the entry into Italy has been thoughtful and respectful,â a Starbucks representative elaborated over email. âWe are very proud of the Reserve Roastery experience we are bringing and have no intention of teaching Italians about espresso. We know we need to earn their respect, every day.â Local businesses are not too worried. âIt will be good for us if a colossus such as Starbucks manages to make high-quality coffee better known,â said Carlo Russo of the Milano Roastery. Unfortunately, though, the Frappuccino and pumpkin-spice-latte-loving crowds will have to wait for the opening of non-premium locations to satisfy their cravings. Luckily, theyâre just a few months away.